Discussion in 'Replica Props' started by trekprops.de, Feb 18, 2006.
i recently got two new Latinum pieces which makes it 4 in my collection. Can anybody tell me how these sizes are called? Bar, ?, Strip, Slip - correct? There's another size of these - the brick - which is not pictured here. So, what's the missing piece? Someone told me that it's called an "Ingot", can anyone confirm this? I don't know much about DS9 and the newer Trek incarnations. I'm a TOS guy. The use of the word "ingot" in the list above seems to be in the generic sense, "a mass of metal, such as a bar or block, that is cast in a standard shape for convenient storage or shipment," rather than in reference to a denomination of latinum. 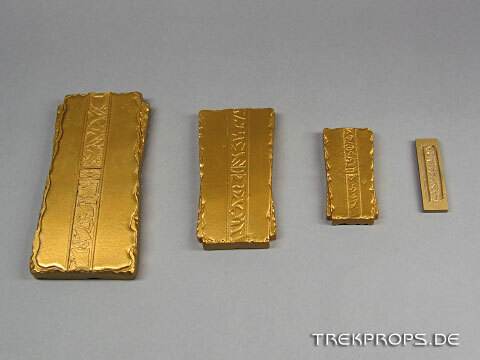 This is not to say that there isn't a denomination of latinum called the "ingot," however. Are you sure that the one on the far left is a bar and not a brick? The far left one isn't a brick. Bricks were shown in the episode where Morn faked his death, and they had a trapezoidal cross section, rather than just being rectangular prisms. I hate to say it but you're spinning your wheels; I've checked all resources I could find and personally own- there are only four denominations of latinum: The Slip (smallest), Strip, bar and brick. My best guess is that whomever created that set wasn't paying enough attention and messed up. On Ebay - someone called the smallest the 1/2 slip - no such thing. The only logical assumption is that since we don't know much about how the currency is made, there could be two different sizes for bars. That sounds illogical though - why would the Ferengi do it? Still, there is no evidence that the Ferengi mint it - the scrip on the currency doesn't look Ferengi. My guess is that someone goofed. if 30cc = 200 bricks --- 30/200 = .15cc equals 1 brick. 15cc (or ml) could have been regurgitated by Morn in the glass for Quark. Morn would have carried 150 cc/ml of Latinum in his stomach to account for 1000 Bricks. These amounts are believable. Gold Pressed Latinum appears to be divided up according to a factor of 5: 100 Slips = 1 Strip, 20 Strips=1 Bar, following this pattern; 4 Bars = 1 Brick. Now if 1 brick equals .15 ml, 1 Bar would equal .04 ml, 1 Strip = .008ml and 1 Slip = .002 ml. Amounts would be ridiculous to measure. The Latinum would be best alloyed with the gold rather than encased in it. There were 5 sizes of Latinum. Pictured above are all but the big bar/ingot. I believe what you have there is a bar, strip, slip and half slip. You're just missing the brick. My frst mold/cast ever. Let there be latinum! Lots of latinum!